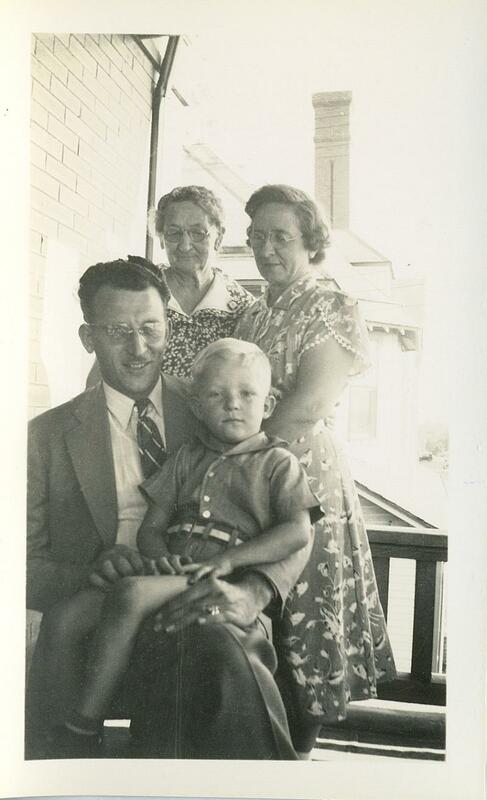 Comments: Cora Mae Perrine (Nee: CORMENY) | NE USA | 1921-1940 | Comments: Possibly a 4-generation photo: Top LtoR: Florence June SIMMONS Cormeny (b.7 Jun 1866, d.31 Aug 1944); Florence's daughter, Cora Mae CORMENY Curtright Perrine (b. 28 Sep 1891, deceased). Man and boy are mysteries, but they may be a son and grandson of Cora's. Photo was taken circa 1939. Some of Cormeny family lived in Antelope County, NE, but this may not have been picture location. Photographer probably was Edwin C. UDEY.